The last few months have been a whirlwind. I’ve recently started a big project that I’m really excited to share with you. Earlier this year I signed a book deal with Stewart, Tabori & Chang, to turn Illustrated Bites into a book! I’ve been delaying announcing the news, because for a long time it seemed too good to be true. Last week I turned in my first chapter, so it finally feels real. Now that the ball is rolling, I felt ready to tell y’all about it. The book is organized by season with four, five course meals that exemplify seasonal cooking. Like the blog, it will have illustrated recipes and how-tos, but it will have added emphasis on how to grow the produce yourself. The working title is Illustrated Bites, From Garden to Table, to be released spring 2015. 2015 still seems like an unrealistic future date, but it will be here before I know it. In the meantime, working on the book has totally consumed me. I’ve been trying hard to stay balanced, eat healthy, and get some exercise. To be honest though, all I want to do is eat comfort food and drink wine. This mac & cheese recipe is comfort incarnate. It’s rich, flavorful, warm, and nostalgic. Also, it’s pretty easy to make. The last time I brought this to a pot-luck everyone went nuts for it. If you’re looking for a crowd pleaser this Thanksgiving, I promise this one is a winner. Boil and salt a large pot of water. Cook your pasta, until it’s super al dente. Your pasta box will have a recommend cooking time for al dente, just subtract a minute or two from that. Drain the pasta, rinse it with cold water, and set it aside. In a sauce pot, combine the cream and the milk. Add the bay leaves and gently warm, but don’t boil. Set it aside. In another sauce pot, melt the butter. When it’s foamy add the flour, and stir continuously until the mixture begins to brown. 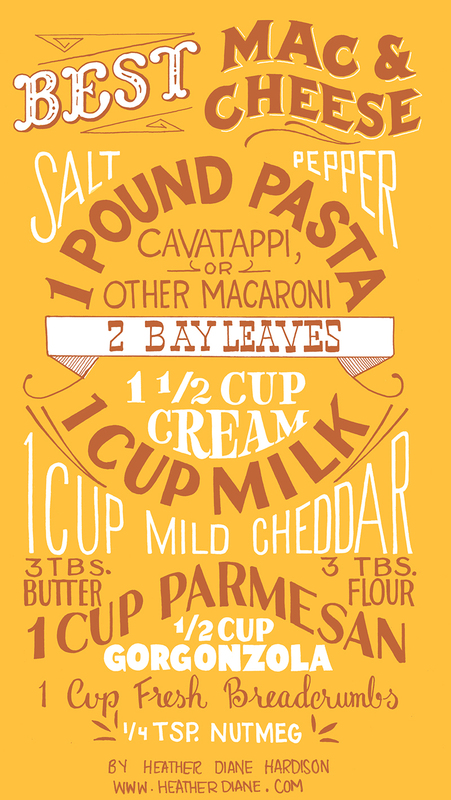 Remove the bay leaves from the half and half, and stir in about 1/4 of it into the flour and butter. Continue to stir, when the mixture is smooth, add a little more of the liquid. Continue to slowly add the half and half, until it’s all incorporated. Mix the gorgonzola and the cheddar into the sauce. Stir in 1/4 teaspoon nutmeg, and 1/2 teaspoon of salt, and 1/4 teaspoon of pepper. Butter a 9x13in pan. Put in the pasta, and pour the sauce over the pasta. Toss in the parmesan cheese and sprinkle the breadcrumbs over the top. Bake for 15-20 minute until it’s bubbling, and the breadcrumbs are brown. Serve hot! I’ll continue to do new posts here, and give you updates on the book. You can also follow my progress on Instagram and Twitter. I hope y’all have a great Thanksgiving!